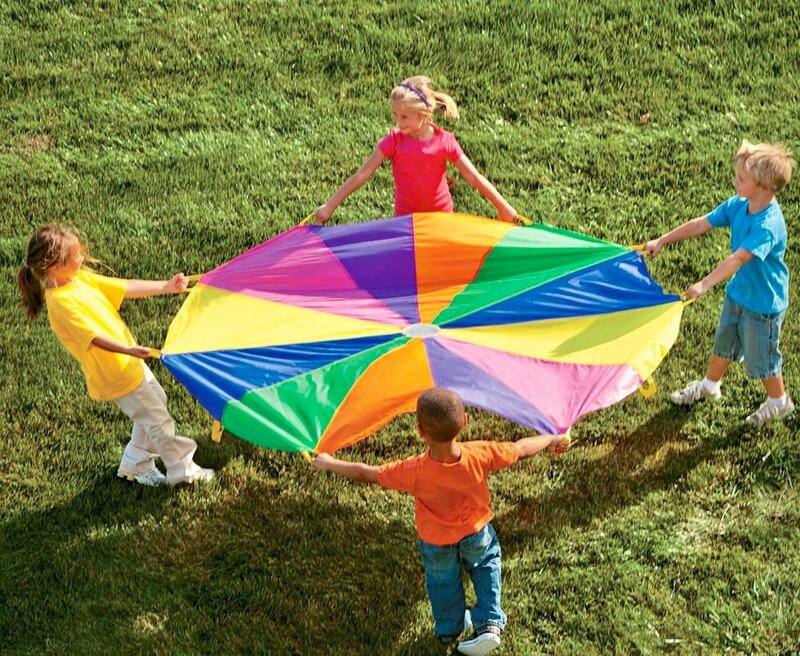 Other companies charge to "add activities" or "to add children". I do NOT. You only pay by time. I fit your activity choices, as many as possible! Most families end up choosing this plan: A Show (Magic, or PuppetStory, or "Frozen" Singalong), then Face Painting and/or Balloon Animals. I love this classic plan. Gives kids a lot of choice. Works great for all genders and developmental stages. 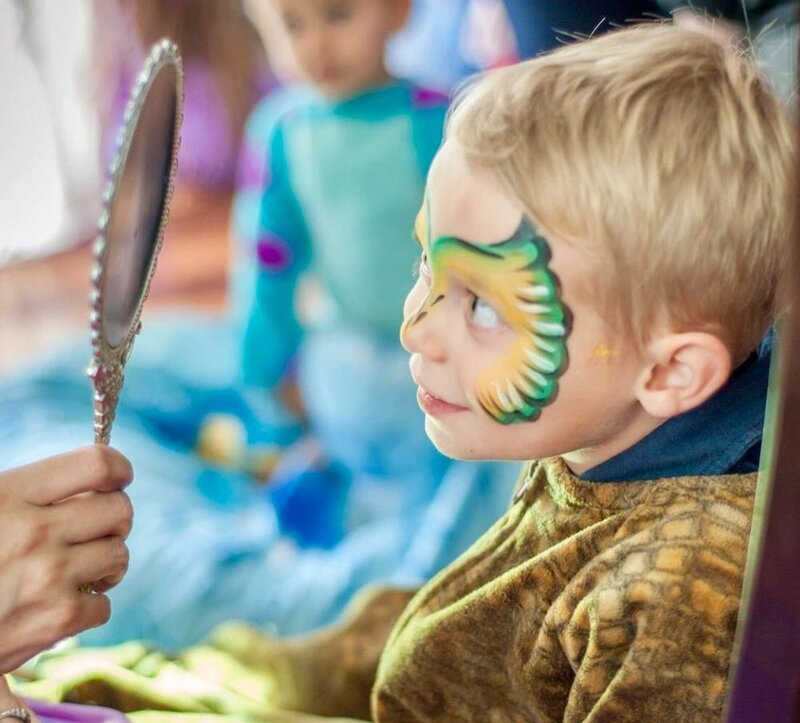 Integrates organically with the other things you need to “get done” at the party (like feeding kids and blowing out candles), and, balloon dogs and painted faces sure make a place feel festive. That said, your choice! You can swap or skip activities to save you money (on my time). By the way, this is a side note to adults, but a really big deal to kids: The birthday child is first for face paint and balloons. I get it. It is important. Don't worry. Some birthday kids will speak up and some won’t. It’s their day, I make sure it feels like it. 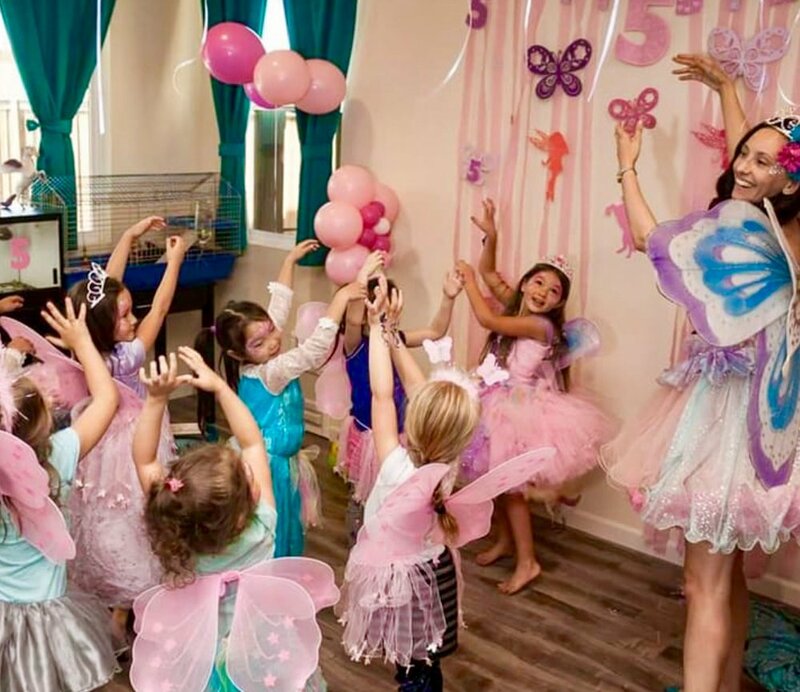 Making the birthday kid feel amazing: I candidly think this is where some non-professional party entertainers fall short. It takes subtle attention and nuanced skill. I make a point to hold the birthday child's hand when we walk around the party. I make a point to dance with them, teach them to courtsey. Unlike newbie performers, it'll occur to me to prompt you, the parent, to grab a photo when a moment is particularly precious. Things like this are easy to miss when you're so busy playing hostess. It is great to have an experienced reminder. I make a point to be next to the birthday person for cake and to whisper to her to "make a wish" as we sing "Happy Birthday." Ask me how to plan a dramatic "Grand Entrance". Text Kris (510)495-5564 for FAST price and availability. Dates sell out. I suggest starting with the Singalong Frozen Show or Magic Show or Puppet Story because group shows build rapport with the kids fast! The show is also the best chance to really make the birthday child feel special! Just please have a chair for me, the character, and a chair right next to mine for the birthday child, and let the guest children sit at our feet on the carpet (or on a blanket, under shade, if outdoors). Optional: A lot parents will decorate the wall behind us. That makes great photos! To kids, I look fancy and fun, but ultimately, I'm still a stranger. The funny, interactive shows build trust fast. Of course it’s up to you what we do first, but if you'd like my advice: Let's do the show first. If you're confused on activities, just ask for the link to make the deposit and I'll call you to plan something fun and realistic to do with my time with you. When the 15-30 minute formal "show" part ends, I hope you’ll see a huge rush to hug the character. That equals = Mission accomplished. 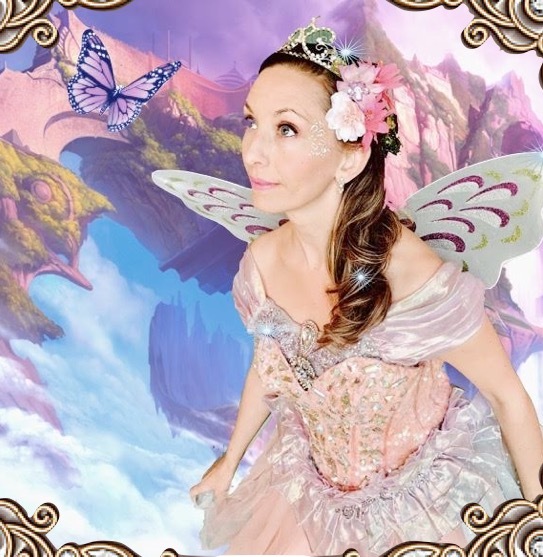 I was honored that the Executive Director of Children's Fairyland wrote this article about me that generously says, "Of the scores of entertainers I've seen...who capture and expound upon the imaginations of children...Kris is one of the best I've ever met." Character acting: I pray this is where I shine. When you choose a character, I stay in character. I am that character. Little dreams are a big deal. As Ariel, I wander to the food table and casually start brushing my hair with a fork. 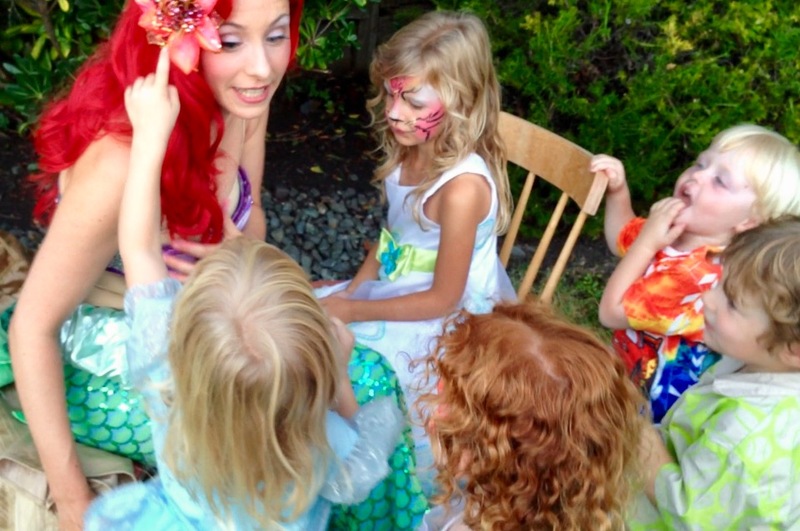 As Moana or a Pirate, I talk about sailing under the Golden Gate Bridge to get to the party. 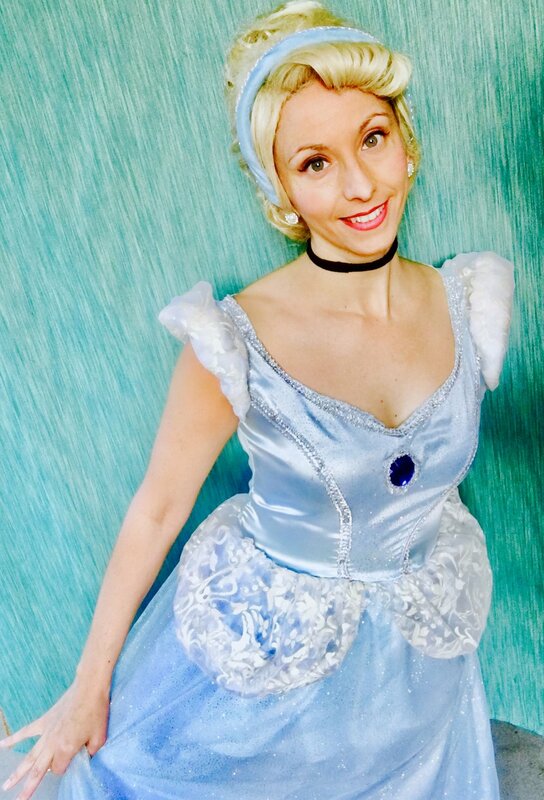 As Cinderella, I ask casually ask the kids for advice about what they do when they lose a shoe. I bring my own sound system. 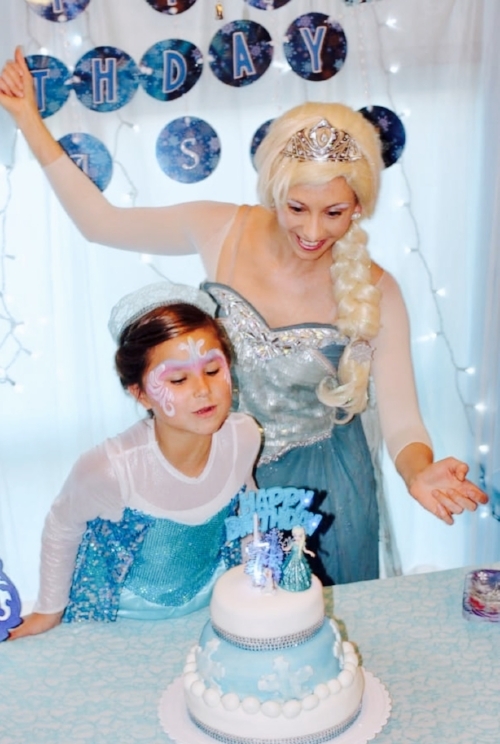 We have the children holds hands in a circle (birthday child gets to hold the Elsa's hand!) and teach them dance moves and have a massive Sing-A-Long with the hits!! KIDS LOVE THIS. I repeat: KIDS LOVE THIS. The kids blast their powers during, "Let it Go." We learn a funny snowman dance to Olaf's song. Between songs I have tried-and-true funny storytelling jokes about Elsa's life. The children never want it to end. 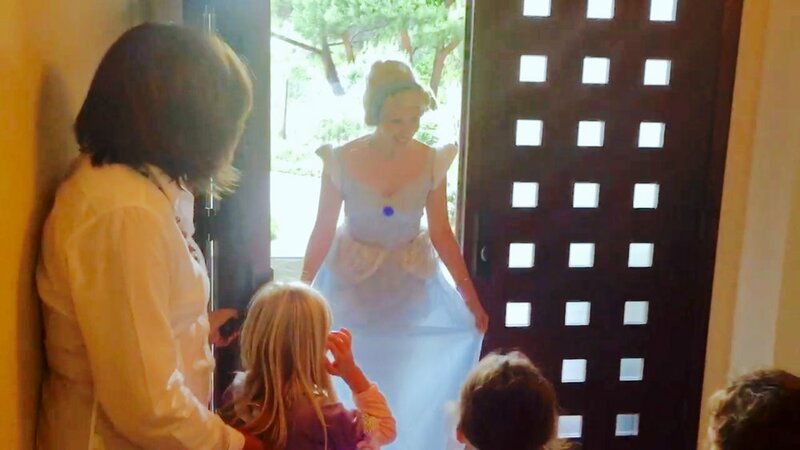 They would do it for hours with "Let it Go" on repeat if we let them, but after you get your adorable video, I promise, for the well-being of the kind adults who have heard the "Frozen" songs enough, we'll move on to more activities. But really. 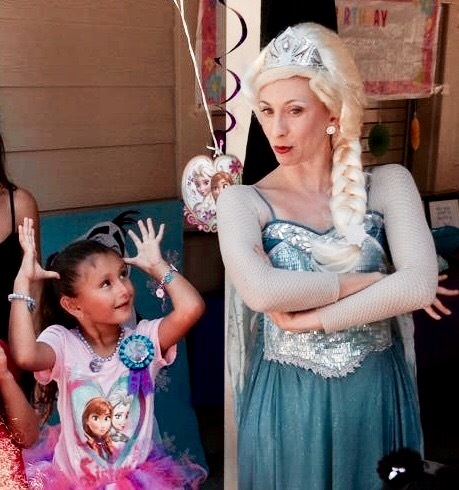 Singing "Let it Go"...With The REAL Elsa?! Yes. This is real life. Not all face painters are equal. I am a "Master Face Painter", with 10,000 glittery faces under my belt. 1) A much faster line. So kids are not bored. 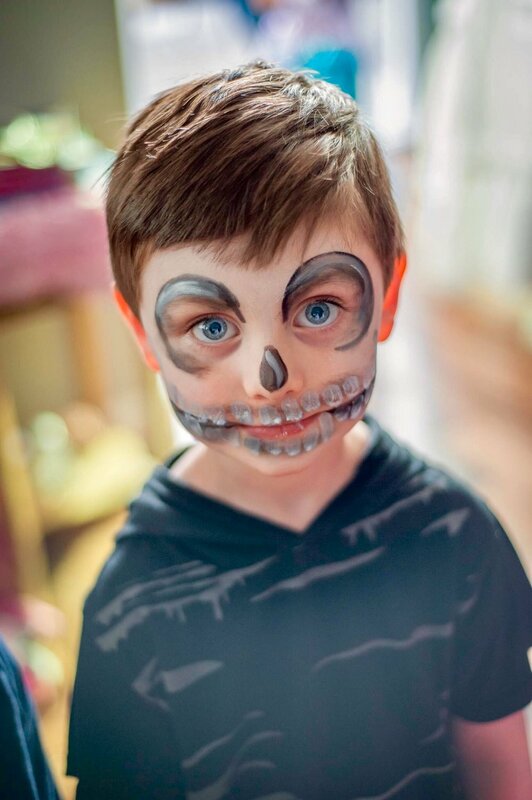 Sadly, many parents discover too late that a company sold them a "longer" package, my same price, but 30 minutes "longer", only to get the unpleasant surprise than in our industry that just means the kids are waiting 15-30 minutes longer for their slower face painting or slower balloon twisting turn. Bummer. I'm honored that a lot of parents have told me I'm the fastest face painter they've ever seen. 2) Never drippy. When other companies send an unspecified subcontractor, they cannot tell you how experienced the person you'll be sent is or isn't. 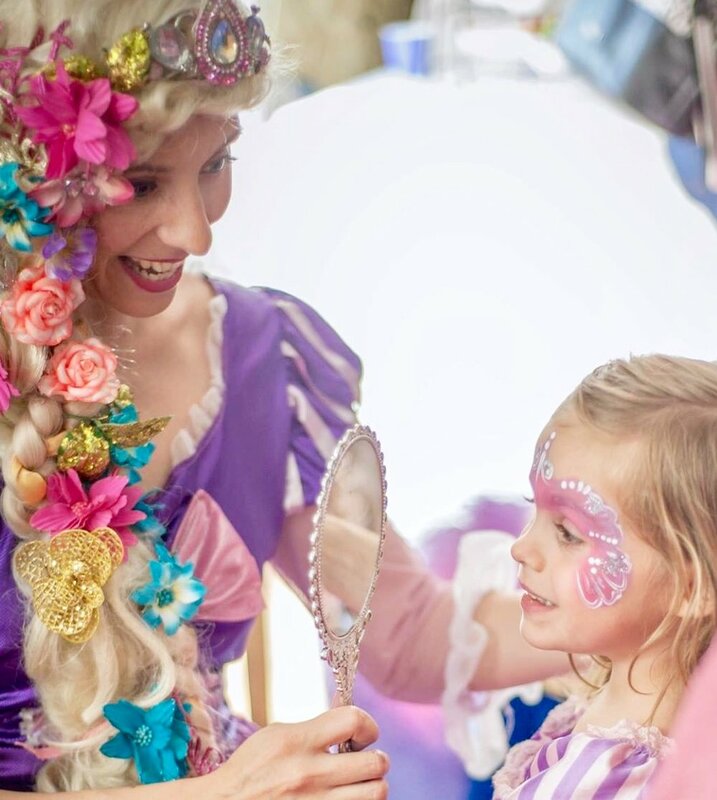 Face painting is a really hard professional skill that takes a few years to learn but most subcontractors are brand new painters. I strive to make sure little faces look amazing because you're going to have these photos forever. 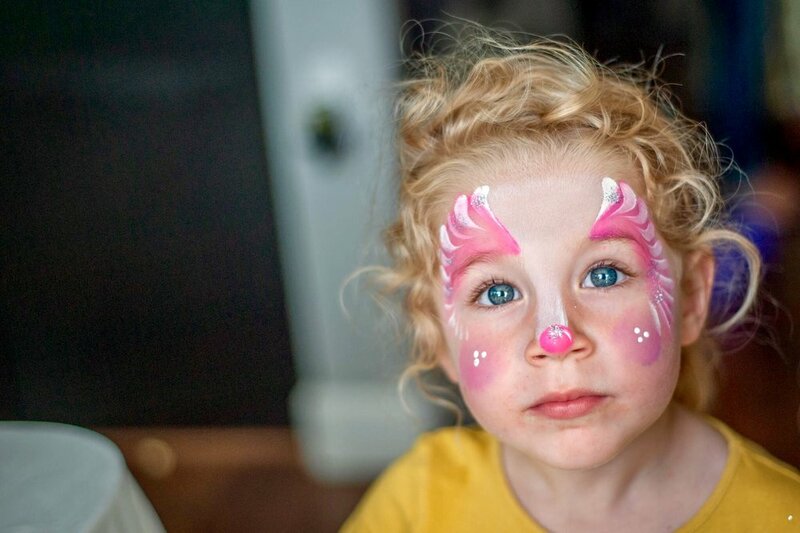 I believe beautiful face paint makes some of the most cherished photos parents will ever have. These particular pictures capture those short-lived moments of childhood. When I owned my former giant company (I have since closed it to upgrade quality) I personally taught more than 100 face painters. That means I can do almost anything. Custom themes? Company logos for corporate events? No problem! What about boys? 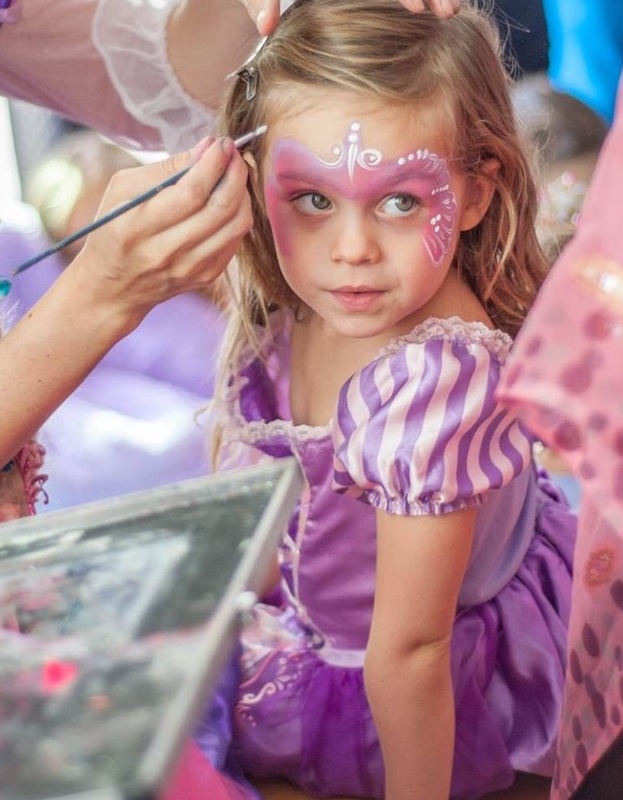 No matter who I'm playing I can offer face paint designs like Spiderman, dragons, tigers, elegant *GLITTER* princess crowns, butterflies....That means if I'm playing a princess little dudes always love the character too. Kids are kids. They care more about what I can do for them than how I'm dressed. 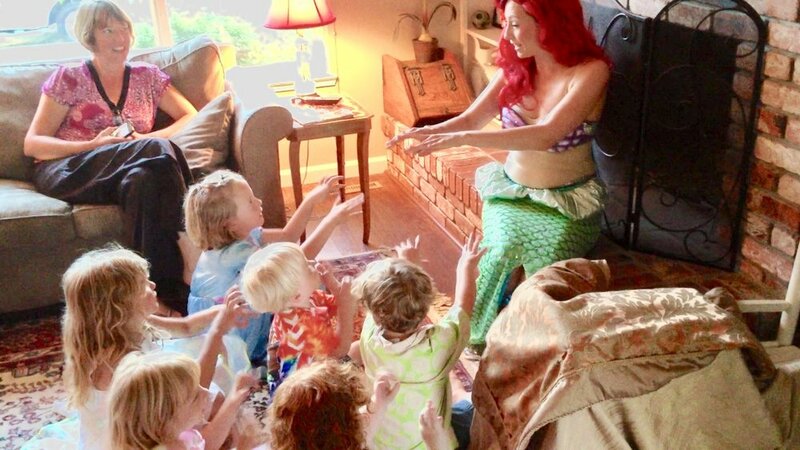 I've never seen a boy not want to play with me once they see me do magic, offer face paint designs they want and, or course, everyone loves balloon airplanes and swords! 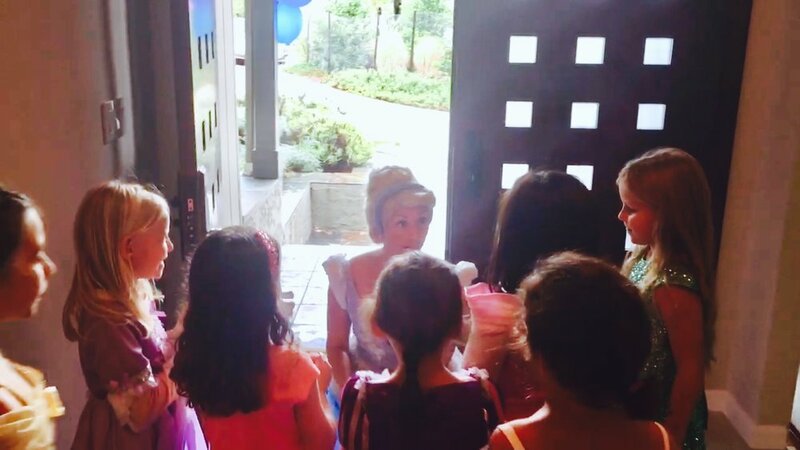 Parents ask all the time if the boys will be in to a princess, but at the parties, it is never an issue. I promise. Kind words from a beloved character go a long way. I feels strongly about this. Kids perceive face paint time as more than getting their face painted, that’s when we get to talk. I also often sing or hum character songs while I'm painting. Some young children prefer hand painting. I am 26-time award-winning professional songwriter and singer. More about my career. This means I can do what other companies can't: Guarantee singing at every party. It's so hard to find. I sing the famous songs of Elsa, Moana, Ariel... everyone! Parents tell me singing is the "dream come true" moment. I feel it too. 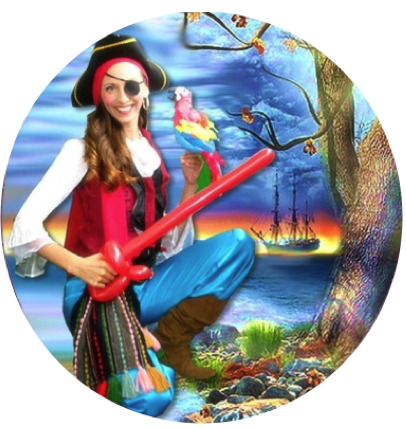 I used to run a larger company, so I absolutely understand why larger companies say in the fine print, "You can request a singer, and we will do our best to arrange one, but we cannot promise it." I too had the same disclaimer for years. When your staff is doing 20-30 parties per weekend, and most are not trained singers, you need customers to know that last minute changes mean you may not end up with a singer. 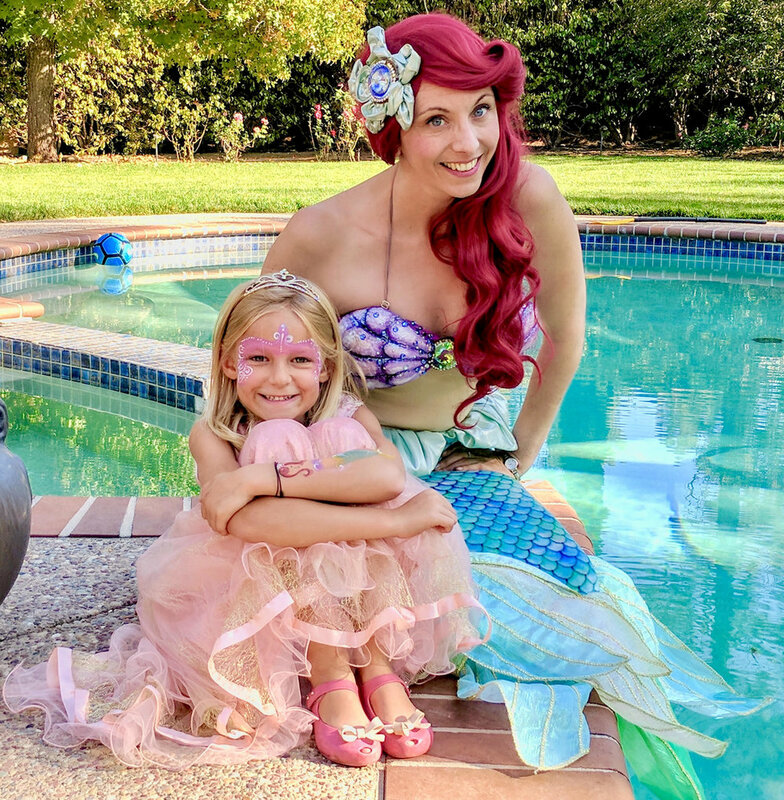 It is too bad, because Ariel singing "Part of Your World", or Elsa singing "Let it Go" is often the emotional pinnacle of the party. I believe it is what kids sometimes hold in their fantasy. 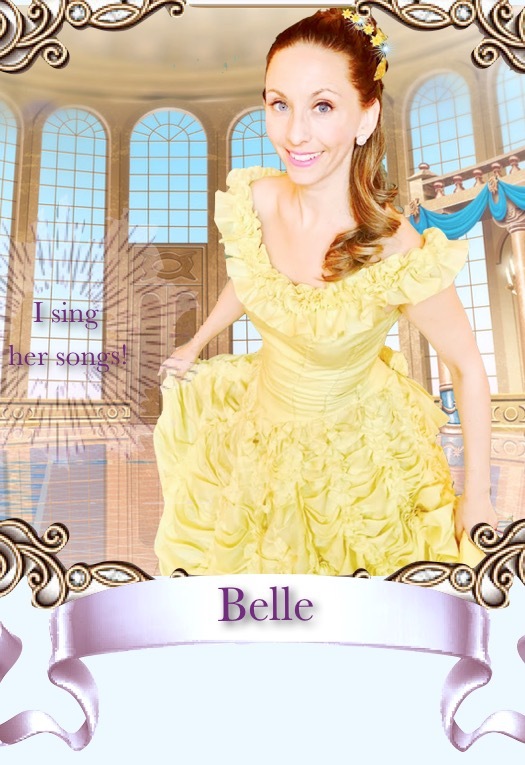 It feels as if, somehow a singing princess is how they make sure I am the real thing. Right when "Frozen" came out, I stopped sending subcontractors and resumed doing all shows myself. That means I could sing at every party. 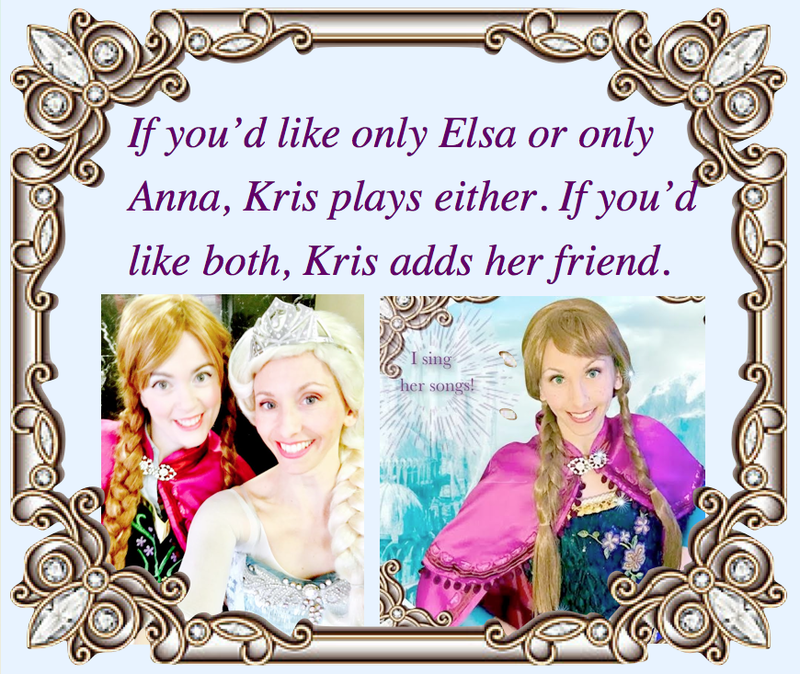 Lucky for me, because kids expect Elsa to sing her mega-hit. Let it grow? Let it snow? What is it? Parents know all too well. I teach them dance moves to dance along while I sing. 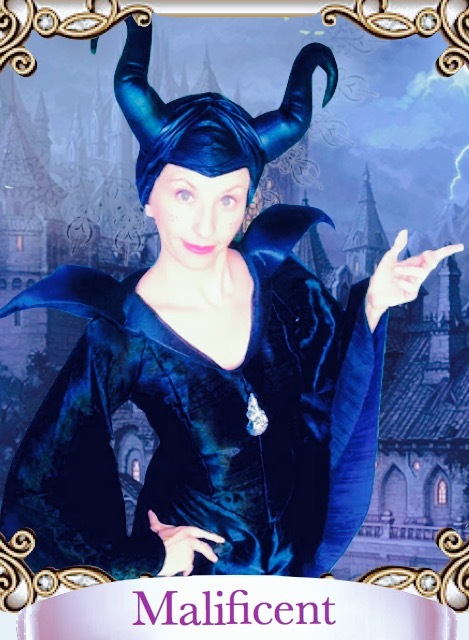 My Magic Show is for kids 3.5 years -11 years old. It is often about 15 minutes, but I can extend it up to 40 minutes, depending on audience age and level of focus. Unless I sense the birthday child is feeling shy, the plot of the show is around making the birthday child feel special. As if the magic is happening because it is their special day. The show is kid-oriented with things children recognize. Sorry, you aren't able to hear the show on my YouTube videos. I had to protect my script which was getting swiped left and right. Maybe a compliment? I can tell you this: Our Magic Show helped me earn four parent "Best of the Bay" awards from "Bay Area Parent" magazine. I'm also a member of the Society for Children’s Book Writers and Illustrators and I wrote this show strategically to reach a huge age range of kids and still be funny for the adults to watch since kid have adorable reactions. You'll be surprised at how young of children comprehend and LOVE magic tricks. 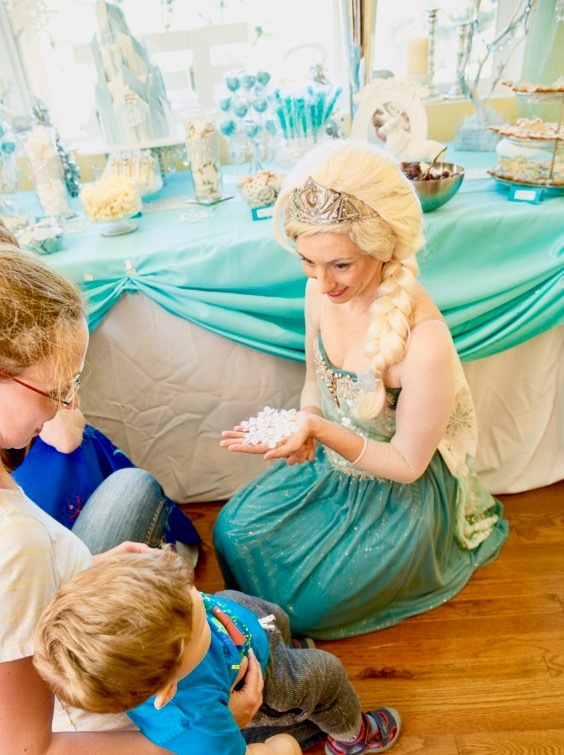 Magic is also my favorite activity for 1st birthdays where the guests are usually mixed-ages of cousins and your coworkers' kiddos, since babies don’t yet have the homogenously-aged little guests you’ll have more often when kids are turning 5-8 years old. The Magic Show gives you, the host/ess, a nice focus for the party, while you're stressed about everything else you can bank on, "Okay, at XYZ time, something organized will happen!" As any character, I can perform my puppet story which is about 15-25 minutes long. I adjust the length based on ages and the rest of our activity plan. 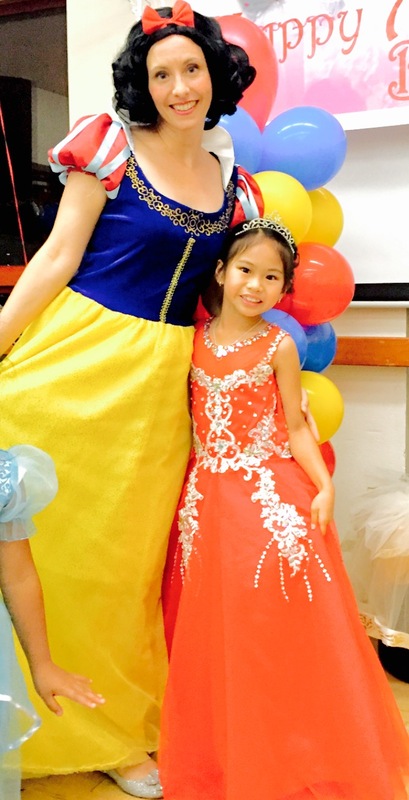 The plot of the story is intentionally written to make the birthday child feel special. I love if you can set up a chair for me and one for the birthday child, so they can sit right next to me. That's great for nice keepsake photos and to make sure they feel extra-cherished on their birthday. I love it for preschoolers, but I also perform it for up to 10 year olds. I designed the puppet story purposefully to take suggestions from kids as the plot develops, so it adjusts to their developmental stage and is still hilarious and challenging for older kids. This is not a talk-at-the-kids boring story. I hate to say it, but if you've seen kids who are bored during a character magic or puppet story then something wasn't quite right. In my story, the kids drive the story's plot by giving input, making sounds like animal noises and clapping...the entire time. 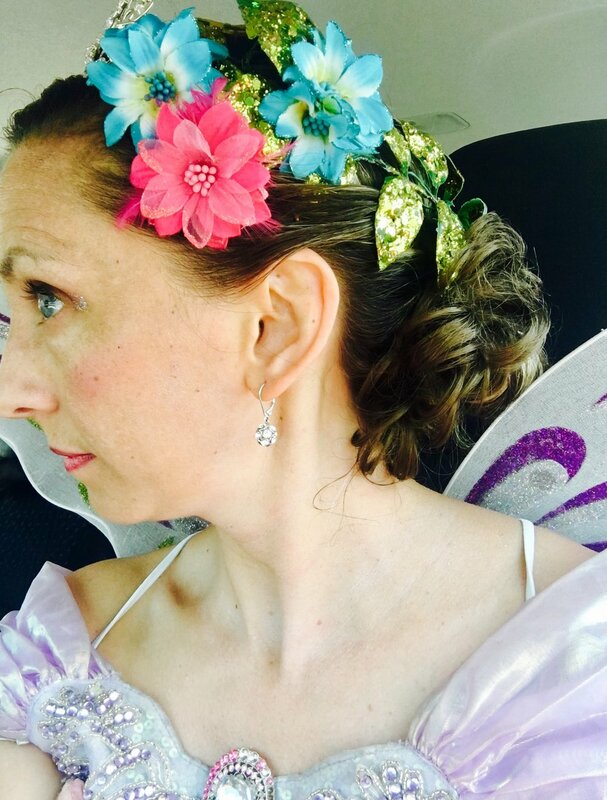 The character, for example Snow White or a Clown or Ballerina Fairy or whomever I am, tells about having brought a wonderful gift but embarrassingly lost it on the way to the party! The kids help me find it by meeting different animal puppets, giving input and making animal sounds the entire time. “Wait! We’re at a river, it is so loud! Can you make this sound with me? Swoosh. Oh! Here is my friend the turtle! Can you pretend you’re a turtle popping in and out of your shell?” The kids mimic the turtle puppet. Active. Unique. Fun. No matter who I'm playing I can always twist balloon shapes that all genders like. I make swords, airplanes, poodles and even tails the kids can wear to match if they’ve been face-painted as an animal like a tiger or kitty! Balloons are great because every developmental stage loves them. The solo independent 12-year-old cousin wants a balloon sword to defend himself, the teenage sister asks for a balloon bracelet or a grandmother will frequently say, “We didn’t have things like this when I was a kid.” This happens so often, nearly verbatim that I have a habit of making her a balloon flower and suggesting a pic together! Get a picture of your mom with Snow White and a balloon flower - or Grandpa in a zany balloon hat with the birthday boy. Seriously. Priceless. I feel strongly that as a pro entertainer, I should also be delighting the adult guests any chance I get. 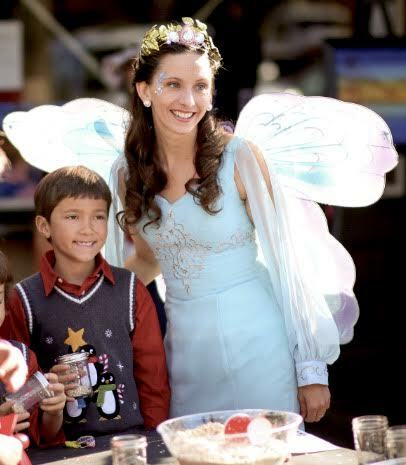 Some families want me as the character to lead singing with the cake. If we don not cram in too many other activities or if you note it explicitly on your order, or even order longer time specifically for it, just let me know and I'll be happy to lead singing at the cake! 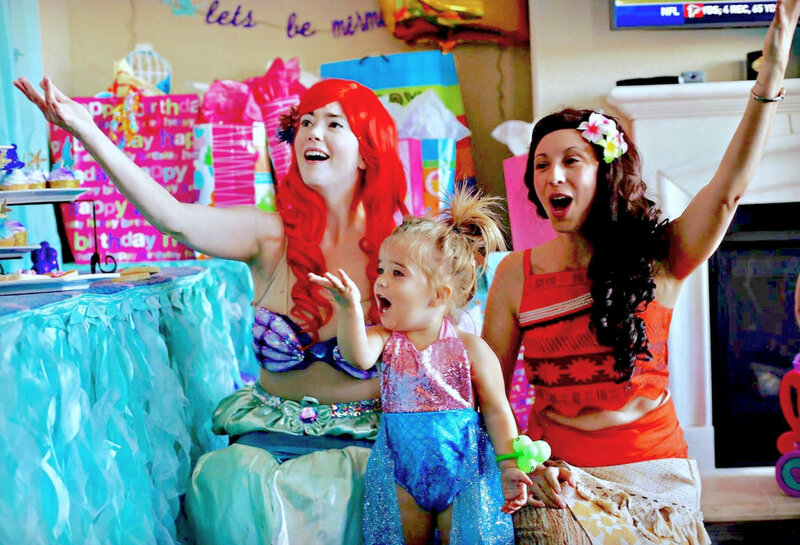 It makes a wonderful keepsake video if you tape me as Ariel, or Elsa, or a Pirate, or Moana...or anyone...announcing and leading the cake ceremony. 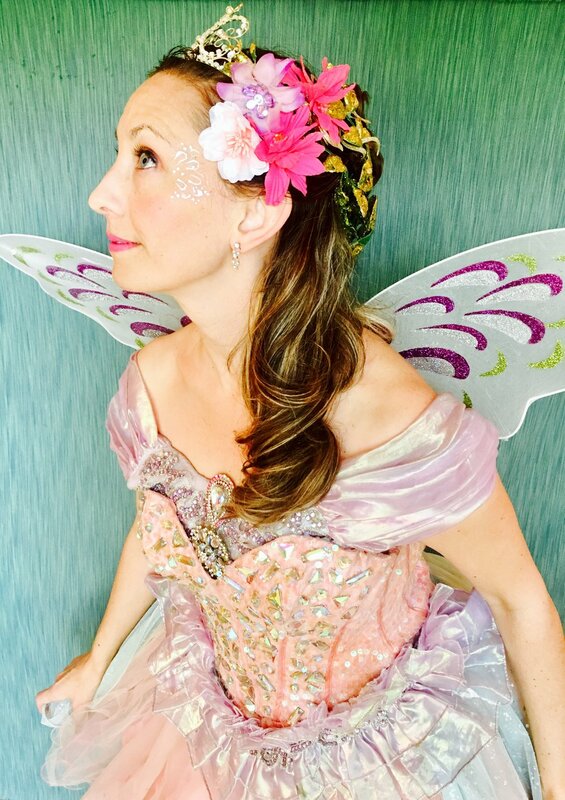 During check out you can add my bringing little fairy dance skirts or little hula skirts to loan children for Fairy Dancing Lessons or Hula Lessons...I've also done makeovers when I'm the Rockstar...finger nail painting, all kinds of custom ideas, just ask!